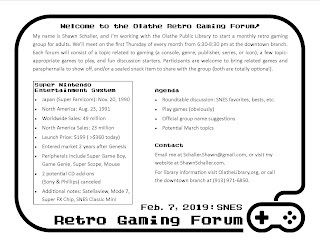 In February I hosted the first of what I hope are many monthly retro gaming forums at the Olathe Public Library (downtown branch) as part of the library's expanding adult activities program. The weather was bad and the publicity minimal (I didn't even have a name for it at the time); a grand total of four people showed up, including my wife and myself. But something very important happened; we had fun! There was good discussion, games I'd never played before, and an opportunity to meet new people - in real life (something I don't often do these days) - who share my favorite pastime. Other than the unsurprisingly small headcount, the group achieved exactly what I hoped it would. I've started a Facebook group, repurposed my blog, and even given the group a name; Nerdstalgia! (It doesn't roll right off the tongue, but it's simple and concise.) Now I need to get the word out to the right people - I'm looking for group quality over quantity - in the region who will appreciate the opportunity as much as I did. Maybe you are the right people? Read a bit more and think about it. 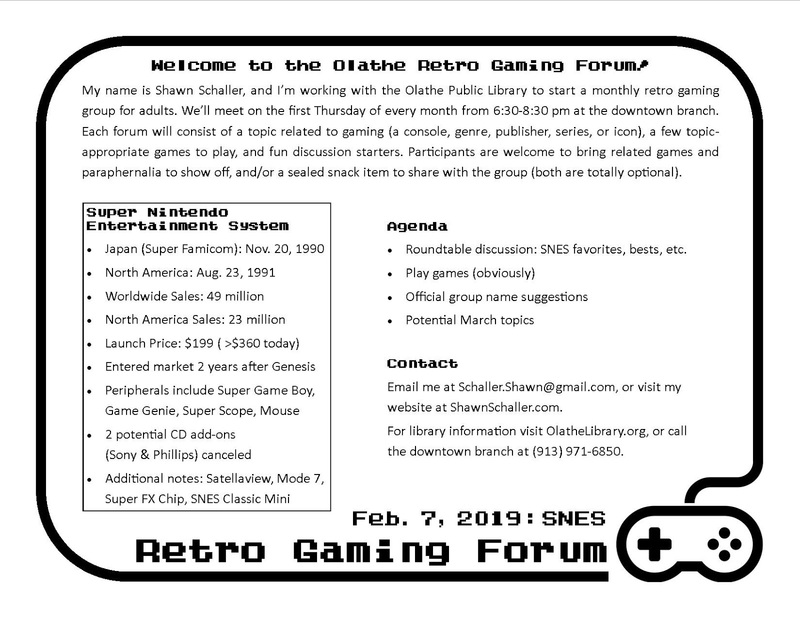 Here's the flyer for the first forum covering the SNES. Topic: Retro video games are the focus, but all old-school entertainment fair game. Members: Adults are the primary audience, but anyone interested is welcome. Agenda: There will be discussion, gameplay, and brainstorming for the next forum. Hors d'oeuvre: I'll bring a sealed bag of chips/snacks to share, and you can too.